This was a spot that I so wanted to visit. I remember little of Lewis and Clark from my history lesson at school as a youngster. Now I want to learn what I missed. 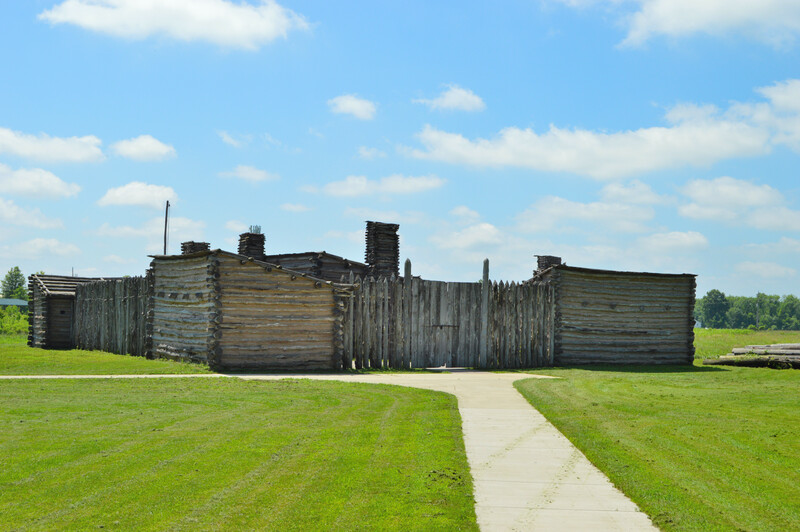 This is where Clark trained his men and prepared them for the westward adventure while Lewis spent his time in St Louis, buying maps, and talking with fur traders and other travelers who had been west of the Mississippi or followed the Missouri River westward. The museum is modern with wonderful exhibits displaying the tools and equipment used for building the fort, cabins and water vessel. We started off with the movie which gives a 15 minute overview and then the inside museum. From there we toured the outside fort with cabins, a farm, ammunition chambers and billets. Our guide said that the fort and living quarters took 20 skilled men about 32 days to complete. The Keel boat was hired out to a marine construction company and it took longer than expected. The trip was delayed until it was ready to sail. Copies of the journals and fine penmanship were displayed and examples of their packaging of the supplies, gifts and living on board were displayed. As an Rver, I appreciated the packaging display. It too was hired out to a professional packer who assisted in the selection of gifts and supplies that would be needed for such a long trip over rugged terrain and various expected encounters with native tribes. They packed a lot of essentials for the trip into a relatively small vessel. I found it interesting that they took good will gifts for the different native tribes that they expected to come in contact with. They hired that research out to specialists that had traveled westward too. Today we call that “Out-sourcing or Contract Workers”. It took us two days to visit due to the rain. We saw the inside one rainy day and returned a few days later for the outside guided tours under the sunshine. This is a “must-stop” for history buffs.